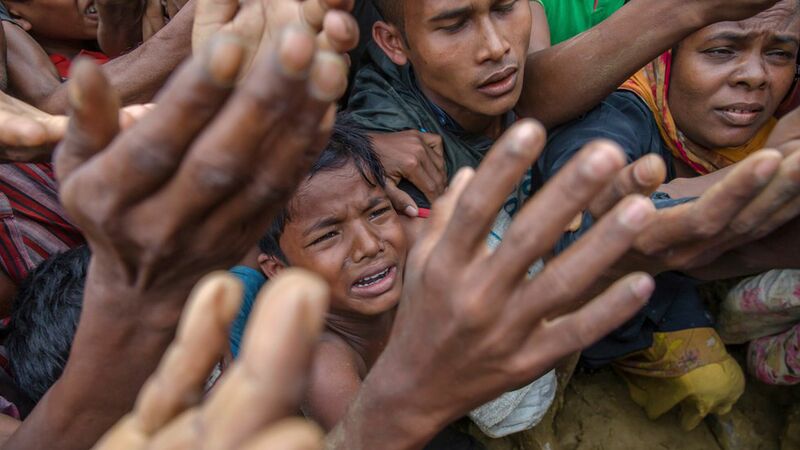 "The crisis began when a Rohingya insurgent group launched attacks with rifles and machetes on a series of security posts in Myanmar on Aug. 25, prompting the military to launch a brutal round of 'clearance operations' in response. Those fleeing have described indiscriminate attacks by security forces and Buddhist mobs, including monks, as well as killings and rapes.'" "On Friday, dramatic scenes played out over and over as hordes of Rohingya who had crossed into Bangladesh overnight tried to make their way further inland. They trudged out of boats and through mud that in some places was knee deep. Men carried babies and old women on their backs. Everyone was exhausted." "Sonabanu Chemmon was among those too weak to walk. Her son-in-law had carried her to one of Bangladeshi's inland creeks, near Shah Porir Dip. But he then abandoned her along with several of her adult daughters." "Asked why, Chemmon covered her eyes as tears fell down her cheeks. 'He said he had carried me far enough, that he couldn't carry me anymore ... He told me, "You can make it from here. I have to look after my own children."'" "Myanmar's government, led by Nobel Peace Prize winner Aung San Suu Kyi, and its still powerful military do not allow independent media free access to northern Rakhine state, from where the Rohingya are fleeing. "While fires are no longer visible from the Bangladeshi border, some refugees told The Associated Press that their homes had been burned as recently as two days ago."